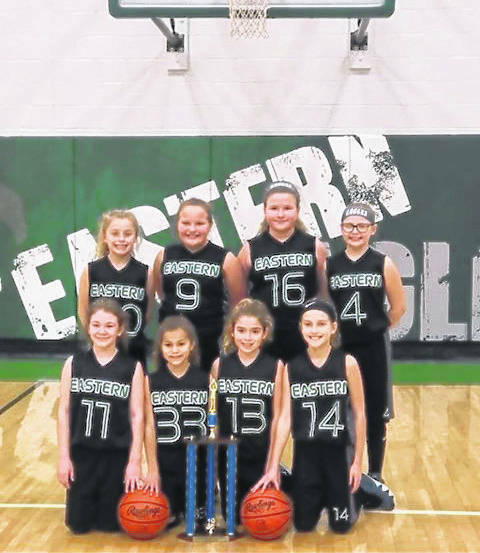 The Eastern Eagles 4th Grade Girls basketball team completed an undefeated 12-0 record, winning the Hocking Valley Basketball League Championship. The team compiled an overall record of 23-4, including tournaments, traveling and playing against teams from eight different counties in Southeast Ohio. They placed first in three tournaments and second in two tournaments. Team members are Aedre Ault, Mackenzie Robertson, Ashlynn Thomas, Rylie White, Nicole Nottingham, Sydney Honaker, Brooklyn Barkey, Sophia Wickersham. Coaches are Ty Ault and Jamie Robertson.